Today I was scrolling through the timeline of people I follow on Twitter and saw a tweet from the account @StunningHijab, ran by Nazma Khan, regarding a wonderful idea. On February 1, she's calling upon Muslim and non-Muslim women around the globe to participate in World Hijab Day. As a fellow Muslim, I applaud this and all women striving to display modesty! In an interview with BBC, Khan said, "I figured the only way to end discrimination is if we ask our fellow sisters to experience hijab themselves." Oppressed! Subjugated! These are probably the words that come to your mind when you see a Muslim woman covered in Hijab (the Islamic modest covering of a woman). You assume it’s her father or some radical male member from her family who is forcing her to dress that way. At least that is what people say to you. That is how the media views Muslim women who cover. Let me ask you, have you heard of the famous sayings: “go straight to the source?” Or “walk a day in my shoes?” I am sure you have heard these a million times. Let me use the first. I ask you sincerely, have you ever gone to the true source for information about Hijab and Islam? Have you read books, asked scholars or visited a Mosque? Have you ever asked a Muslim woman why she is so covered in a world that seeks to shed as much clothing as possible? If you asked a Muslim woman, she would inform you that the purpose behind her Hijab is to obey her Creator over the creation. Her Creator, Allah (God), did not legislate Hijab in order to oppress her, but rather to free her from the shackles of this world. He ordered Hijab as an honor and sign of dignity for women. When a Muslim woman covers her hair, chest and body, she is sending a silent message that she respects her body and like a pearl in the ocean, she covers it with her beautiful shell (Hijab). No one has the right to observe, gawk at and judge a Muslim woman by the highlights in her hair or curves on her body. Instead they judge her for what is in her mind, her character, and her goals and ambitions. Hijab is prevention from being accosted by ignorant minds who only judge a woman by the clothes she wears and the skin she shows. A woman’s body as you know is sacred and this is why Islam encourages women to strive to cover and protect it. Let us return to the second saying, “Walk a day in my shoes.” This is where WHD comes in. What is that you ask? 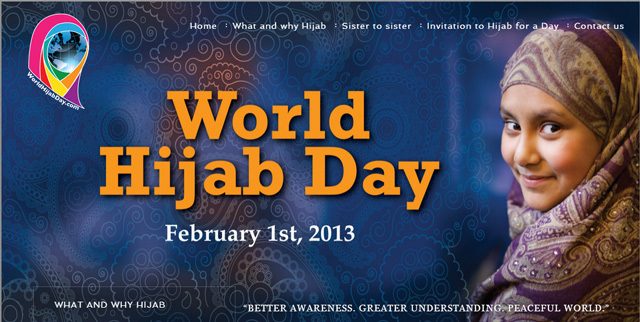 WHD is short for World Hijab Day. This first time annual event will be held on February 1st, 2013 (God willing). On this day, we ask Non-Muslim and Non-Hijabi Muslim women worldwide to observe Hijab for a day. It will be a day for everyone willing to experience what it’s like to step inside the shoes of a Hijabi. Our hopes are no less than that. We wish you will gain a wealth of knowledge and experience a slightly different definition of FREEDOM. Brother Jesse Blog supports WHD! For more information about World Hijab Day visit www.worldhijabday.com, Facebook and Twitter. Watch the official promo below!